Days 136 – 141 In Buenos Aires, before flying home to U.K.
Today, we walked to Cementerio de Recoleta, a popular tourist spot several miles from our hotel. Once there, we saw impressive statues and marble mausoleums, set out in grid-like ‘streets’. In all, there are around 4,500 individual mausoleum buildings. At one point, we tagged onto an English-speaking tour and learned that the rich and famous had bought their plots many years ago and that all are now taken, although family members can still be added to the existing crypts. There are steps down within the mausoleums to underground vaults, up to 25 feet below what’s visible at ground level. It was sad to see some had been neglected and had been left to decay, some with ivy growing all over them. Many famous politicians are interred here as well as Eva Peron although we couldn’t find her family plot. We spent quite a while wandering around in the sunshine, but it became very hot in the sfternoon so we found a cafe to sit outside and had a late lunch before heading back to our hotel. We spent the morning booking our flight home and sorting out some of our stuff, when we realised it was actually a really sunny day outside (the hotel windows are tinted and made it look slightly dull), so we put off finishing the sort-out until later. We went out to find the San Telmo Market which has a huge antique and craft market at the weekend, but during the week just the indoor market part is open. We had a wander along the ‘lanes’ between the stalls and could only really look as limited space in our luggage for returning home. The market locality was very pleasant, with cobbled streets and impressive colonial buildings, and plenty of small grocers and cafes. We enjoyed lunch at a small, traditional café and then explored the area further, ending up at another nice café where we sat outside for a while with lemon tea, people watching. Today we visited the Palacio de las Aguas, a beautiful water tower which is faced with over 300,000 tiles, that has now been de-commissioned and converted into museum. It was constructed in 1884 at a time when there was a need for clean water after an outbreak of Yellow Fever. We strolled around the different rooms looking at taps, drainage pipes and a plethora of old lavatory equipment…..some looking remarkably like those in many of the places we have stayed at! Today was much more interesting than it sounds! We were up early today as we had to be at Ezeize Airport to meet our shipping agents, Javier and Sandra, who are assisting us with transporting the bike back to the UK. First, we sorted out the documentation (bike registration document, temporary import permit and passport) and then removed the bike’s windscreen, mirrors and rear luggage (top) box. We’d already removed all of our non-bike related gear and flammable liquids such as WD40. We then emptied the petrol tank and jerrycan. Shipping costs depended on the size of the crate, so we made the dimensions as small as possible. Mark then rode the bike to the customs warehouse where Sandra began the formalities to get clearance for the bike to depart. I had to wait in a nearby café with Javier as the warehouse area had restricted admittance. By mid-afternoon the bike was cleared and ready for transit. We said our goodbyes to Javier and Sandra, and caught a minibus shuttle back to the centre of Buenos Aires, in a somewhat sombre mood as now the bike was crated and it truly felt like we’d come to the end of our journey. Tomorrow we have to go to a freight office in the centre of the city to pay for the transportation costs. We heard today that HMS Protector, an English ice patrol ship, had docked in the harbour. Apparently, the English and Argentine Governments have been involved in joint research in the Antarctic and the ship’s visit is an illustration of improved bi-lateral relations between the two countries. This vessel was also one of the first to assist in the search for the Argentine submarine ARA San Juan, which went missing last year. We will try and have a look at it if time allows. We walked to the Navicon office in the Lavalle area of the city and paid for the bike’s shipping. We were pleased to see Javier and Sandra again, who were there on business. Our paths may cross again if we manage to get to the Horizons Unlimited travellers’ weekend in May, back in the UK, which they are attending during a 6-week visit to England, Wales and Scotland. Lavelle is very good for shopping and has similarities to London, so we had a good look around the shops and I purchased my first item of clothing in five months! We had lunch in a nice traditional restaurant, El Globo, which had a very good set menu, so we spent a while sitting there enjoying the atmosphere and the attractive interior. The rest of the afternoon was spent admiring the old buildings in the area and making the most of being outside in the sunshine. On our way back to our hotel there’s a Yamaha motorbike shop we had a look in. Imported bikes attract a huge tax tariff….this 1200cc Yamaha was for sale at US$33,200 (£23,310) whilst in the U.K. one can be bought new for a little over £10,000. Smaller bikes, however, are made in South America under license and, with far less tax, are considerably cheaper. We’ve been so lucky with the weather this week as we again woke up to a bright sunny day…. but sadly our last day here in Buenos Aires before we fly home tomorrow morning. We walked to Plaza Francia in Recoletta, to a large Artisanal market. There were a few buskers playing tango music, and we spent several enjoyable hours wandering through the stalls and then having lunch outside, in a café we discovered a few days ago. On the way back we bought a bottle of champagne to celebrate the end of one fantastic journey and to the next, wherever that may be. 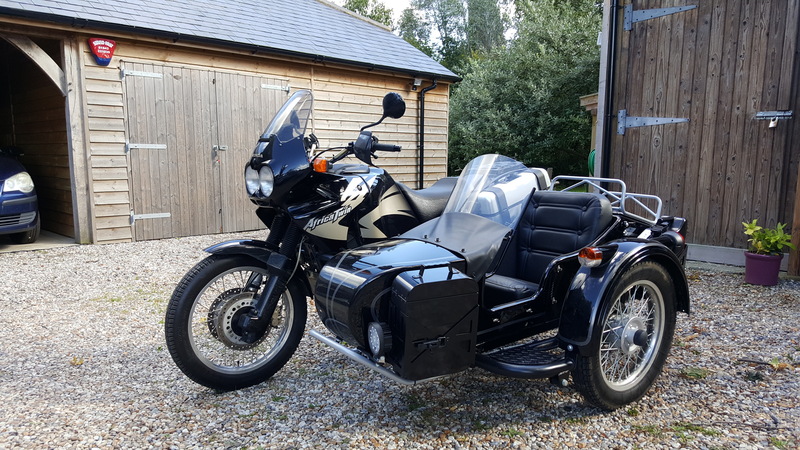 Last night we had a knock on our cabin door – an English guy staying in another cabana had seen our bike and invited us over for a beer and bike talk (he had a Suzuki DR800 and a BMW K1100). We chatted about our journey and he – being married to an Argentino – told us a bit about local customs, Argentinian politics, and interesting places we should visit if we had had more time! Today, after 250 miles, we stopped at a town on Ruta 14, Mocoreta, and found a small hotel to stay overnight. Just like many places we’ve stayed in, it would have been so much nicer if it had been well-maintained over the years. The power and light sockets/switches were sellotaped to the wall and the ancient shower had seen far better days! However, the cost was the equivalent of £17.60! However, we really enjoyed our short stay. The proprietor was friendly and there was a small shop in the reception area, so we bought a litre of local Quilmes beer and sat at a table in the pretty garden before heading into town to get some supper. We woke up to a slightly overcast day, with rain forecast for later. Indeed, as we headed along Ruta 14 towards Buenos Aires, we had to stop and put on our waterproofs when it started to pour with rain. We also decided to stop off at a hotel earlier than usual because of the miserable weather and found a quirky place to stay in Gualeguaychu. The old building had previously been as a tannery, and had more recently been converted into a hotel using reclaimed doors, fittings and furniture which made it a very interesting place. The river Gualeguaychu was very near to us, so we enjoyed a walk into the town centre along the pleasant riverside. We sat at a large communal table in the kitchen for breakfast with the other guests and enjoyed croissants, Danish pastries, tea and fresh coffee. As we packed up, we thought we should have maybe stayed another night as it was so nice here, but we need to get to Buenos Aires with a couple of days to spare before the bike is crated and flown home. The bike has been very reliable over the 15,000 km we’ve clocked-up, but we thought that if we delayed our return and anything happened to it, we’d have less time and we must be at the airport cargo area very early on 12th April. We also want a couple of days in Buenos Aires to sort out our stuff and do a bit of shopping and sight-seeing. We had another day of heavy rain, so the ride to Buenos Aires wasn’t that much fun, but we made good time and arrived at our hotel by 4pm. We decided to stay at the same hotel as when we were here a month ago, as it’s an ‘apart’ hotel complete with small kitchen, plus secure underground parking. We can only have bike-related items with the bike when it’s crated at the airport, so will have to unload and take all our camping equipment with us on our own flight. Any hazardous items, such as camping gas, are forbidden as well as anything with a toxic or flammable symbol on it. So, today we used most of the petrol from our jerry can, which will provide enough fuel to get to the airport, with a couple of litres to spare – any more than this and the tank will need to be drained before the bike is accepted for transit. Today we visited the Iguazu Falls and it was a breath-taking experience. They are larger than the Niagara Falls and, according to Wikipedia, cover a distance of some 3km with 275 individual waterfalls, which can be seen from both Brazil and Argentina. They are situated in a National Park which protects the flora and fauna within it, including monkeys, coaties (racoon-like animals), birds, and literally millions of brightly coloured butterflies which are flying around everywhere and landing on all the visitors as they walk along the paths and metal walkways leading to the waterfalls. There’s a train that takes visitors to different viewing levels, as well as several nature trails to follow. We started at the top level and worked our way to the most spectacular part of the falls on the Argentinian side, known as the ‘Devils Throat’. We could hear the water crashing down before we saw it, and it was an amazing sight. The sound of the full force of water crashing down to the pools at the bottom was extremely loud, and the spray coming back up both blurred our vision and soaked us. On the upper level (or ‘Superior Trail’ as it was called), we had the best views of the falls. With the sun shining through the water mist, a huge rainbow appeared across the canyon, which we will never forget. After spending several hours wandering around, we headed back to one of the train stations to get a drink. There were signs warning about the coaties, which can bite and scratch, as well as steal food. We were amazed to see there were numerous coaties the station area – they didn’t seem to be bothering too many people, but all of a sudden one’s face appeared between the two of us and nearly stole our lunch! Later on, we saw a group of monkeys in the trees with small babies on their backs. They seemed very tame and let people take photos of them. One small one was eating something yellow – perhaps a leaf – but on closer inspection it turned out to be a sachet of Hellman’s mayonnaise! On our return to the car park we decided to walk through the forest, along one of the trails, rather than use the train again. A guy walking in front of us suddenly stopped and pointed out a Toucan, high up on a tree, which was another amazing sight. The visit to the waterfalls today was definitely one of our most enjoyable days of our trip, but we’ve had so many wonderful experiences it’s impossible to say which one has been the best! We decided to stay an extra day as we have enjoyed it here so much. We had a quiet morning and then rode down to the edge of town to the Tres Fronteras (Three Frontiers). Here, the rivers Iguazu and Parana converge, where the borders of Argentina, Brazil and Paraguay meet and can be seen from a single view point. It was incredible to see the 3 countries simultaneously and was another lasting memory for us I’m sure. It’s a shame that we haven’t the time to ride into Paraguay, a country largely by-passed by tourists and one of the least known of the South American countries. Tomorrow, we leave here and head south towards Buenos Aires on the final stage of our trip. We’ll both be sad to leave South America; it’s been an incredible journey over the last few months. We said a sad farewell to La Cantera Jungle Lodge and took Ruta 12 towards Posadas, turning off onto Ruta 105 and then Ruta 14 which will take us the 800 miles or so to Buenos Aires. After riding for 240 miles today, we stopped overnight at Gobernador Virasoro at the Cabanas Las Azaleas where we hired a pleasant cabana. We actually rode this route several days ago on our way to Iguazu and remembered seeing all the tourist coaches returning from Iguazu, feeling excited that we were going there! Now we too, sadly, are returning and should be back in Buenos Aires soon! We picked up our new tyre from Gustavo and once we’d paid, he asked us to wait a minute whilst he went to the back of the shop. When he returned, he had 2 shop logo T-shirts which he gave us, which was very thoughtful of him. We asked if there was somewhere nearby where we could get the tyre fitted, so he phoned a nearby workshop to arrange it for us, which was really helpful. After saying our goodbyes to Gustavo, we rode off to the workshop which was two blocks away. The mechanic was looking out for us and soon had the bike jacked-up and the rear wheel off. We had to wait in his workshop whilst he took the wheel and tyre to a nearby tyre shop in his van! Finally, the wheel was back on the bike, and after chatting to the mechanic about his drag racing trophies and looking at some of the bikes in his workshop, we set off northwards towards the next big town, Santa Maria. We rode until around 5pm and then started looking for somewhere to stop for the night. A motel on the edge of the town of Cacapava do Sul, twenty miles short of Santa Maria, looked fine for us, but being 3 km from the town centre resulted in us having our supper in the garage café next door to the Motel as we didn’t really want to get back on the bike and ride to the town centre in the dark. We had a bit of a disturbed night’s sleep due to noisy revellers outside the motel and also traffic entering and exiting the garage next door, but at least we were up early and ready to leave before most other mornings. We rode through some very picturesque forests and countryside, reminding us of home, along a mixture of road surfaces with potholes and undulating tarmac to stretches of smooth paved road. We reached the town of Santiago and booked into a hotel we’d seen when doing some on-line research. It’s Good Friday today and we didn’t want to risk having any problems booking a room if we left it too late. We went to reception to check for vacancies and then to look at the room. Unfortunately, the receptionist had trained at the Fawlty Towers School of Customer Service and was extremely rude! We had limited Portuguese and she had no English, but instead of speaking slowly to us and improvising, she spoke louder, quicker and got visibly cross with us. We were both quite shocked at her manner as this was the very first time since we’ve been away that we’ve met someone who has been less than friendly and helpful. However, it meant that we could talk about her attitude in front of her and she had no idea what we were talking about! A friendly porter could see our problem and tried to make amends by being very helpful and taking some of our gear up to the room, which made amends to some extent. Whilst the Hotel was again on the edge of town, it had a restaurant next door and we both looked forward to a nice evening meal as we hadn’t eaten since breakfast. We headed out for supper only to find the restaurant closed so we ended up in a nearby garage café again with another sandwich and ice cream! Tomorrow, we will have to try and get it right! We had another disturbed sleep due to a dog barking all night in a neighbouring property. It had been raining most of the night too, and was still raining when we packed up to leave, so it was a day of waterproofs being put on and taken off when the rain stopped. We headed towards the border crossing to go back into Argentina and made good time arriving there by 2pm. We had our passports stamped for the exit from Brazil, and then were told we needed to get a Carte Verte (Green Card) to get into Argentina. We’d never needed this before and were directed to an office which supplied them, only to find that it was closed. The friendly Federal Policeman who’d stamped our passports said we had to have this document or we couldn’t pass through the border checkpoint, so we were given directions of where to obtain one. This entailed riding 4 miles back into the town on the Brasilian side of the border, Sao Barjo. When we found the address, it was a private house in a residential street. Luckily, the occupant was in and seemed to know all about the Carte Verte, which was a relief to us as it all seemed a bit bizarre! After answering some questions about how long we were staying in Argentina and handing over 50 Reales, we suddenly realised we had just bought insurance for the rest of our stay (which we didn’t need as we had this already!) Anyway, he turned out to be a very friendly guy and he confirmed he was in fact a broker and nothing to do with the police and/or customs who has sent us to him! After getting our passports stamped into Argentina and getting a new import permit for the bike, we rode through the checkpoint and were never asked at any time for the Carte Verte we’d just purchased! Live and learn! The rain had started again by now and so we made the decision to stop as soon as possible. The first town into Argentina, San Tome, wasn’t too far away but we should have stopped to put on our waterproofs as we ended up getting soaked during the short ride there! The Hotel – the first we came across – looked a bit grim but we decided to chance it and in fact it was better inside than its outward appearance suggested. Later, we walked to the town centre but couldn’t find any restaurants which were open, so found a Supermercado and ate our supper in our room….the third night without a nice hot meal! In nearly every hotel room we have stayed in, Mark has had to re-tune the TV or correct a plumbing issue. This morning was no different as we didn’t appear to have any hot water despite running the taps for a while. We went to find the concierge who came up to the room and ran the taps again for another five minutes, but by the time the water had become hot it was flowing up from a drainage grate set into the floor tiles, flooding the bathroom floor. He had to go and find a mop and towels to dry the floor, but at least we had hot water now. However, we had the same drain problem later, right after we’d finished our showers! Breakfast was also like an April Fool’s joke! There was no bread, only a single plain cake and coffee! When we asked for bread – as there was butter and jam on the counter – the grumpy kitchen maid put a few dry crackers on a plate! Anyway, we packed-up and continued our route towards the Iguazu Falls, which are located to the north-eastern tip of Argentina, at the boundary junction with Brazil and Paraguay. I’ve been looking at places to stay there and hopefully we can find a lodge in the sub-tropical forest, with a little bit of luxury! The scenery was very lush with forests, huge fields with cattle grazing. We also drove through an area where there were several Mate plantations. Mate, a type of caffeine-rich tea, is very popular in South America and many people carry their Mate cups and flasks of hot water around with them wherever they go. They stop at service stations to top-up their flasks with hot water and we’ve seen hot water vending machines outside the services, too. When talking to our neighbour at Punta del Diablo a week or so ago, he told us that even the politicians take their Mate cups and flasks into parliament with them! We have tried it and it is an acquired taste. Our stop for the night is in the town of Montecarlo. Unfortunately, it has no resemblance to its namesake in the South of France, but hopefully we’ll be able to find somewhere there for supper, other than a garage café! Last night we found a restaurant in the town and enjoyed our meal sitting outside in the warm evening. Today, we booked our next hotel at breakfast and we will be staying in a jungle lodge just outside Puerto Iguazu, just 20 minutes from the waterfalls. The weather first thing this morning very misty but the forecast was good for later on, so we packed-up and headed off for the final stage of our journey to the Iguazu Waterfalls. It was a short, 80 mile ride and as we approached the town we both noticed that the bike’s windscreen fairing was wobbling more than usual and feared the worse – the welding repair we’d had done to its metal support bracket back in San Pedro de Atacama appeared to have failed after some 3000 miles and numerous bumpy roads. We pulled into a service station where Mark had a closer look and confirmed our thoughts. However, we were able to secure the support bracket with cable ties which held it tightly in place. We now only have to ride 800 miles or so to Buenos Aires to ship the bike back to the U.K., so will probably have the bracket re-welded once we return home rather than try to find another welder here unless it’s absolutely necessary. Some of the roads we’ve ridden on have been dreadful compared to UK roads, and to think we used to moan about the potholes there! They are nothing compared to those in South America – some drain covers are missing, decent roads suddenly turn into pothole-ridden roads with no warning, and there are also many ‘sleeping policeman’ humps in and out of the towns and at a number of junctions, bends etc. outside of the towns. We arrived at out hotel in the early afternoon and it’s all I had hoped it would be. Our room has a small balcony from where we can look out into the sub-tropical forest. Everywhere we look we can see butterflies, some as big as bats. After settling-in we went to the pool area, took the last of the sun for the day and had a swim. Hopefully this afternoon we’ll hear back from the bike shop where we ordered our new tyre, and then we can head northwards to Santa Maria. Once there, we’ll then have to decide whether to ride further north to Iguazu Falls (the largest series of waterfalls in the continent) and back to Buenos Aires, or alternatively head back down through Uruguay to Buenos Aires where our bike has to be delivered to an agent on 12th April for shipping home to the U.K. This afternoon, we walked along the quayside to the Oceanographic and Antarctic Museums where we spent a few hours looking at the marine exhibits and interesting videos of sea life. There were also had a couple of pools with penguins and a walrus, who were convalescing. A small pier led out into the lagoon which gave us a clear view of the channels of water. When we arrived back at our hotel in the late afternoon, we’d had a text from Gustavo at the bike shop to let us know that the tyre had arrived, which was a relief. What a difference to the weather when we woke up this morning. It had rained overnight and continued to rain until well into the afternoon, with distant rumblings of thunder. We sat and waited it out as we would’ve got soaked packing up the bike, and also it’s no fun riding in the pouring rain especially when we don’t really have to! We did consider staying another night, but we had started to get ‘cabin’ fever by now in our compact container home! We made the decision to go when it was only drizzling as it was just 25 miles to the border crossing at Chuy, and then we could find somewhere to stay quickly if the weather turned again for the worse, but best made plans never seem to work for us! When we arrived at the border crossing at Chuy, it only took about 15 minutes to get our passports stamped out of Uruguay and to hand over the bike permit at the customs. The quick drive through Chuy (which was a tax-free ‘no man’s land’ between the Uruguayan and Brazilian border controls) took no time at all, but it was when we got to the Brazilian border crossing that time seemed to stand still. Unbeknown to us, today was the start of Holy Week and it looked like everyone from Uruguay was going to Brazil on their holidays. The queue to immigration/passport control took us 3 long hours of waiting in line and then, when we finally went to get the new import permit for the bike, no one really seemed to know what they were doing, so that took ages too. Once we were through customs it was nearly 7 pm and getting dark – we were now in a strange country with no local currency, we didn’t speak Portuguese and had nowhere to stay for the night! We headed towards the nearest town, Santa Vitoria do Palmar, which didn’t look too attractive in the dark, and stopped at the first hotel we saw as by now it was gone 8pm and pitch black. Mark had to wake the hotel’s concierge who was asleep on a sofa in a back room, but he was very friendly and showed Mark the room whilst I stayed with the bike. It wasn’t a great room, but certainly not the worst we have stayed in, and we were just relieved to have found a place with secure parking. The concierge recommended the restaurant next door and by this time we weren’t that fussy about what we ate either as we hadn’t eaten since breakfast. The menu was in Portuguese, the waiter only spoke Portuguese, and I only remembered ‘obrigado’ (thank you) from a holiday to Portugal when I was a child! Anyway, we ordered Milanese which turned out to be battered meat (we think it was beef?) with rice, chips and salad. For anyone reading this from my Weightwatchers group in Deal, you’ll be proud to hear that I took off the batter and only ate the meat which was in fact very tasty! Also, for two huge portions and a litre of beer, it cost a paltry seven pounds! We will leave as early as possible in the morning! We had a low expectation for breakfast but at least the bread rolls were fresh and the coffee hot, but the banana jam was slightly weird! It was still raining but we wanted to get going as soon as possible, as you will appreciate from the photos below! As we headed towards Rio Grande (possibly not the one you may have heard of as there are several), we saw plenty of interesting bird life and small creatures running across the road, and also those that unfortunately didn’t quite make it! The birds were huge, like cranes, and looked magnificent when they flew overhead, just like Tetradactyl! We also saw numerous wading birds since we were riding along a peninsula with the sea to the east and a lagoon to the west. We stopped at a service station for a coffee and chatted to three friendly bikers from Uruguay and Columbia, and also a chap who lives in the town we are heading to, Rio Grande. He recommended a hotel with sea views, and he also mentioned that he was the director of several museums in the town. He went on to say that he’d lived in London whilst working at the Natural History Museum in South Kensington. We trusted his judgement on the hotel choice in Rio Grande and booked there and then via booking.com as didn’t want another hotel like last night’s! We were soon on our way again but stopped when we saw that the Columbian guy (who had overtaken us a few minutes before) had pulled over and appeared to be holding something which we assumed had fallen off his bike. When we got nearer, we saw that in fact he was holding a large tortoise which had been in the middle of the road. We were amazed to see one so close, and relieved too that it hadn’t been added to the road kill we had previously seen along the road. The hotel was great and had a fantastic view of the Lagoa dos Patos, a huge lagoon that leads out to the Atlantic Ocean. There were many large fishing vessels moored along the harbour, which we can see from our room, as well as people fishing along the edge of the quay. We plan to stay here for 2 nights as we need another rear tyre for the bike. It’s not completely worn yet but as we’re in a large town it should be relatively easy to purchase one here before we head off. After a great breakfast we walked into the town to locate the bike shops Mark had researched on-line. The first shop turned out to sell only bicycle tyres, the second didn’t have any in stock but they were very helpful and phoned another shop which apparently had what we wanted. Unfortunately, when we got there they didn’t have the correct size (140/80-17) but could order one in which will take a few days, so we opted for that. Rio Grande is not the most attractive town, but we like the hotel and have decided to upgrade to a suite for very little extra money so that we get more space, a sofa and a small kitchen, enabling us to prepare our own meals for the next few days. We transferred into our suite and then headed towards the old part of town, where the old port is also situated. We walked through the area where locally-caught fish is processed and sold at the local fish market. There’s also a new port further down the quay which is the second biggest port in Brazil, according to Wikipedia. The town has built-up its wealth from this port, and also has a petrol refinery on the outskirts, so both have secured employment for locals. There are many old, Colonial-style buildings, many of which have been left to deteriorate over the years which was a shame as they had beautiful, ornate features including tiled walls and detailed wrought iron-work around their windows. When first built, they would have been stunning properties. We also wondered how anyone had been allowed to construct huge, ugly 1970’s buildings next to many of the old, low-rise buildings! We stumbled upon a Maritime Museum and had a brief look around. Unfortunately, all the display captions were written in Portuguese, but it was interesting to see the collection of maritime artefacts as well as the many small boats which were on display in the huge, former warehouse. I was personally interested to see a ‘Mirror’ dingy, a small wooden sailing boat. My father had built one of these boats from a kit when I was a child and I had learnt to sail in one in Chichester, Sussex. We knew the designer, Jack Holt, so to see one in Brazil was an unexpected sight! We strolled around the town for a while and were surprised to see so many shoe shops, where all the shoes had 2 price tags on them. One was for the full price and the other was for paying in instalments! Mark had read that Brazil has a huge shoe manufacturing industry, being one of the top 3 shoe-producing countries in the world, and it’s a shame that there’s no room for me to take any home! Our new tyre, ordered yesterday, is supposed to arrive tomorrow.